What's the difference between freeware and commercial tunXten versions? What is all this OpenVPN stuff anyway, uh? I noticed tunXten installs and uses some kind of Windows service, why is that? Does tunXten "call home" or otherwise access external Internet resources? What are these TAP adapters and why do I need them? 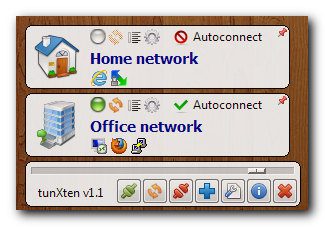 Is tunXten compatible with 64-bit Windows OS? I bought multiple licenses but received only one license key, is there something missing? Where does tunXten store OpenVPN configuration files? My antivirus/antimalware software tells me that tunXten (or its installer) imposes some threat for my system, can you explain? Note that you can still change anything you like, but the changes will only last for a working session and after you restart the application everything will be reverted back to defaults. Purchasing a license removes this limitation, and moreover - you won't have to reconfigure tunXten, it will load your previously saved preferences after the registration code is entered. We believe the best way to get acquainted with the basics is to visit the official OpenVPN Community site, an abundance of useful documentation can be found there. OpenVPN requires administrative priviges for some operations, the most important of which is to actually make a connection. And one of the best security practices for Windows is not to use Administrator accounts for daily work. The tunXten service is designed to bridge the gap between commonly used restricted (or even guest) accounts and the need to do things requiring elevated privileges. The tunXten GUI transparently delegates all the necessary work to the service. By default tunXten is set up to periodically check for updates, so it accesses its website looking for a newer version, but it's a one-way communication - it only queries the information and does not send anything to the site. Besides, if you don't like this behavior you can disable it in the settings. A "tap" device is a virtual ethernet adapter which is required by OpenVPN to create a secure connection and a TAP-Win32 adapter represents an endpoint of a VPN tunnel. So, basically, for every VPN connection there should be one TAP adapter as well. 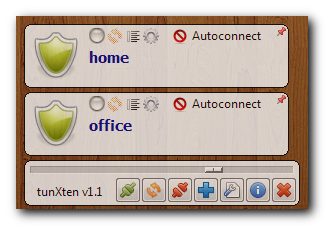 You can easily add/remove adapters using the Advanced tab of the tunXten settings dialog. Yes, although tunXten executables are 32-bit binaries, they work perfectly on 64-bit Windows, in fact, we extensively use it every day on our workstations running Windows 7 Professional 64-bit. System-wide location - the 'config' directory in its installation folder (if you're using the personal edition then generally the directory is not there as it's intended to be handled by sysadmins, see the details here. OpenVPN configuration files found there are available to every user of the system. Your personal storage - the 'tunXten' directory in the Application Data folder located in your Windows profile. These configurations are visible only to you. Note: the system-wide path will not be shown if it doesn't exist. No protection software is perfect, and even the most popular or sophisticated one is still prone to jumping to conclusions every now and then, making false positive decisions. We can absolutely assure you there are no threats or security concerns about our products. You can check it out yourself by grabbing the installer and submitting it to any online virus scan resource of your choice. In fact, we actually did so with version 1.0.4 and you can see the report here. Also, when someone tells us that their antivirus is complaining about our product, we don't just let the whole thing slide - we always try to reproduce the behavior and submit a false positive report to the antivirus vendor so they can fix the problem.